Ultimalt is the perfect combination of sweet satisfaction and rich creaminess providing delicious malty flavour. 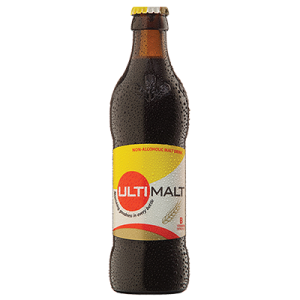 This non-alcoholic malt drink is enriched with B vitamins for nourishing goodness, and is also free from preservatives. Produced with the most naturally available ingredients, brewed and bottled here in the UK, every aspect of Ultimalt is created with perfection in mind. The raw materials used in Ultimalt are sourced locally in the UK from fully traceable sources. The barley malt is grown in East Anglia & the fine quality English hops are grown locally in Kent. The hops used in Ultimalt are extracted using CO2, this pure extraction method gives a refreshing slight bitterness which enhances the malt flavour. The philosophy used in the making of Ultimalt is to keep the process simple by using traditional brewing processes. This enables Ultimalt to be made using the natural properties of barley to deliver natural malt flavours and the slight bitterness of English hops. Ultimalt is produced locally in the UK by a heritage brewery who has a history of producing high quality, traditional beverages. Kato International LLC, is a vibrant, independent US based import company, largely responsible for the importation and distribution of alcoholic, non-alcoholic beverages, consumer goods and other food items in the US. They specialize in sourcing, marketing and providing quality speciality drink brands, premium consumer goods, and carefully packaged food items for the US market. Ingredients: Water, Barley Malt (50%), Starch, Sugar, Colour (E150c), Hops, Carbon Dioxide, Vitamins B1, B2, B3, B5, & B6. Contains Barley.